Use with USB 2.0 A/B device cables. Supports data transfer rates from 1.5 to 480 Mbps. Use with USB 2.0 A/B device cables. Backwards compatible with older USB 1.1 cables. Twisted 28/24 AWG data lines along with double-shielded cables with tinned copper braid provide optimal speeds. Gold-plated connectors provide superior conductivity. Extend a Hi-Speed USB 2.0 Signal Up to 16 ft.
Don't settle for inferior workmanship and performance! 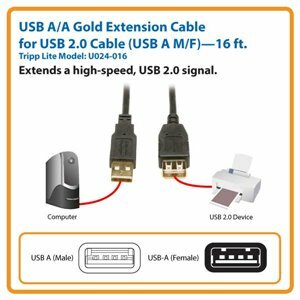 The U024-016 16-foot USB 2.0 Gold Extension Cable meets or exceeds all USB 2.0 specifications and supports data transfer rates of up to 480 Mbps. The U024-016 includes gold-plated connectors and gold-plated copper contacts for superior conductivity. Unlike cut-price cables, it is manufactured to exacting specifications with superior materials for a difference you can clearly see. And we back our pledge of quality with a lifetime product warranty. Tripp Lite's U024-016 16-foot extension cable is the ideal choice for maximum USB 2.0 performance for multimedia and other high-end applications over long distances. Use the U024-016's USB A (male) and USB A (female) connectors to extend connected high-speed USB 2.0 devices such as printers, scanners, external hard drives and external DVD players to a USB computer for fast, error-free data transmission. Legacy USB 1.1 devices also get a speed boost with transfer speeds up to 480 Mbps. The U024-016 is manufactured using top-quality materials. Gold-plated connectors with gold-plated copper contacts offer optimal connectivity. Premium double-shielded cables with tinned copper braid and aluminum Mylar foil feature twisted 28/24 AWG data lines for maximum EMI/RFI protection and signal quality. Molded connectors and integral strain relief guarantee durability and long life. A flexible PVC jacket makes the U024-016 easy to install, even in tight corners and other space-constrained areas. For peace of mind, the U024-016 comes with a lifetime warranty and green, RoHS-compliant design.